A plug for safety … May is National Electrical Safety Month and GRDA is passing along some important tips that can help you stay safe. 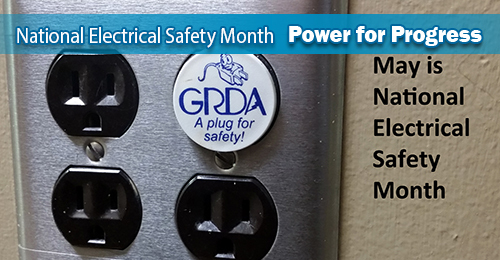 May is recognized as National Electrical Safety Month by the Electric Safety Foundation International (ESFI) and once again, the Grand River Dam Authority is proud to join with ESFI in passing along some important electric safety tips. This week, we’re looking at our homes, the dangers of overloaded circuits and the way we can avoid this potentially deadly problem. All major appliances should be plugged directly into wall receptacle outlets. Only plug one heat-producing appliance into a receptacle outlet at a time. A heavy reliance on extension cords is a good indicator that you have too few outlets to address your needs. Have a qualified electrician inspect your home and add new outlets. Only use the appropriate watt bulb for any lighting fixture. Using a larger watt bulb may cause a fire. Finally, remember: power strips only add additional outlets; they do not change the amount of power being received from the outlet. For more electric safety tips, visit www.esfi.org and check out next week’s column.